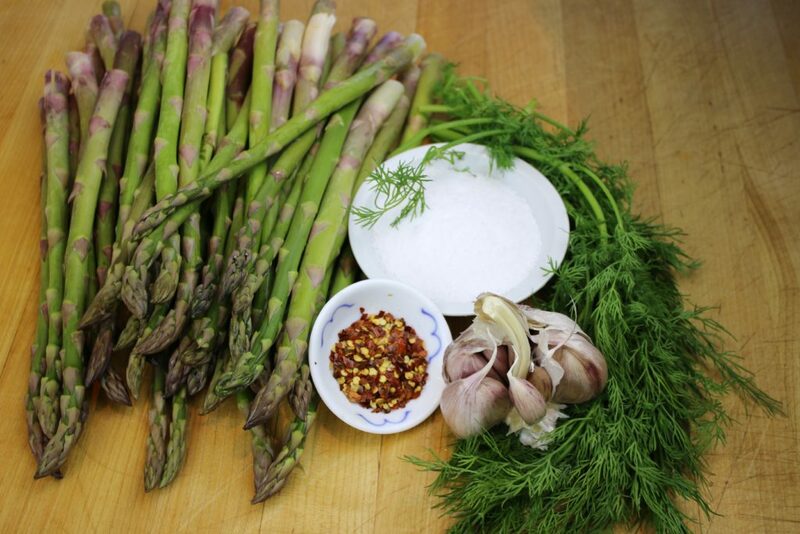 Dilled lacto-fermented asparagus is a multi-tasking treat: probiotic, prebiotic, full of nutrients and delicious! A multi-tasking treat: High in nutrients, prebiotic, probiotic and delicious! I’m a multi-tasker, as most of us have to be to keep up with the demanding schedules of our work and children. Eating well is important, so I look for food that can multi-task for me: one that is both tasty and as nutritious as possible (no empty calories!). 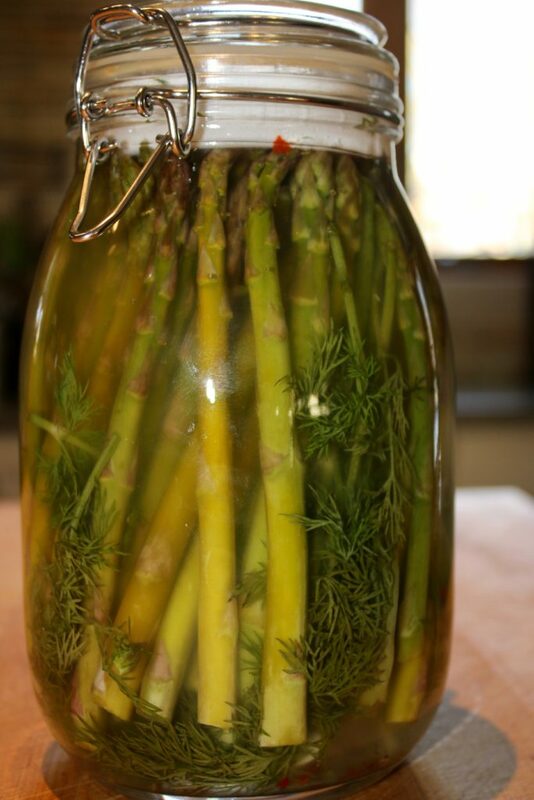 Dilled lacto-fermented asparagus is an excellent candidate : it is high in nutrients, prebiotic, probiotic and delicious! Asparagus is inherently super healthy. 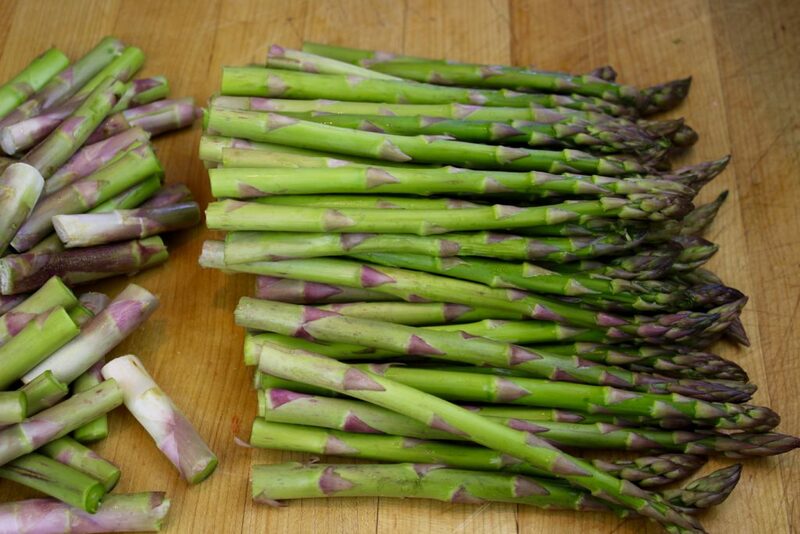 High in folic acid, vitamins B6 and C, beta-carotene, magnesium, zinc and chromium, asparagus helps fight inflammation and regulates blood sugar. Asparagus contains the plant fiber inulin, an excellent prebiotic (a sought-after food source by our hungry gut bacteria). Adding prebiotics to our diet feeds our gut bacteria, making them more effective in aiding our metabolic processes (i.e digestion) as well as helping to fortify our immune system. Adding Probiotics to the mix….. The lacto-fermention process used in making these asparagus pickles also provides us with probiotics. Once ingested, these beneficial bacteria help out our resident resident bacteria and immune system. 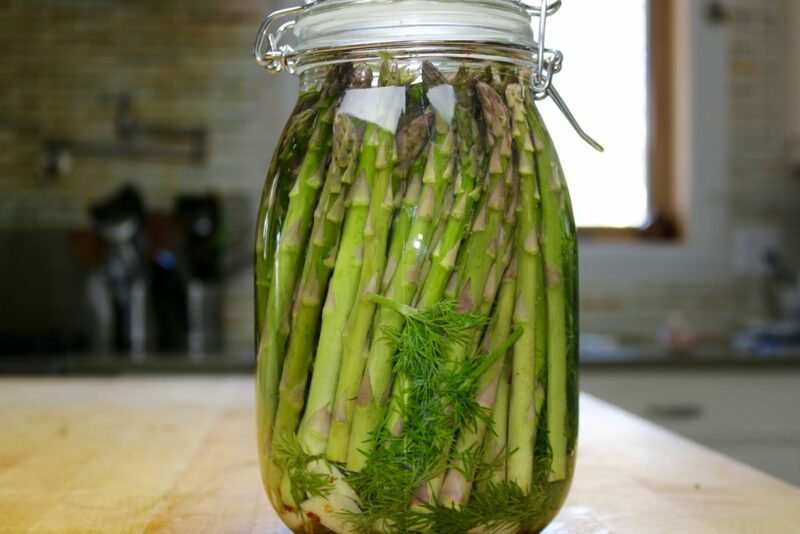 Dilled lacto-fermented asparagus is a win-win-win food for our health, palate and gut bacteria, and it’s easy to make! Cut woody end off asparagus spears. 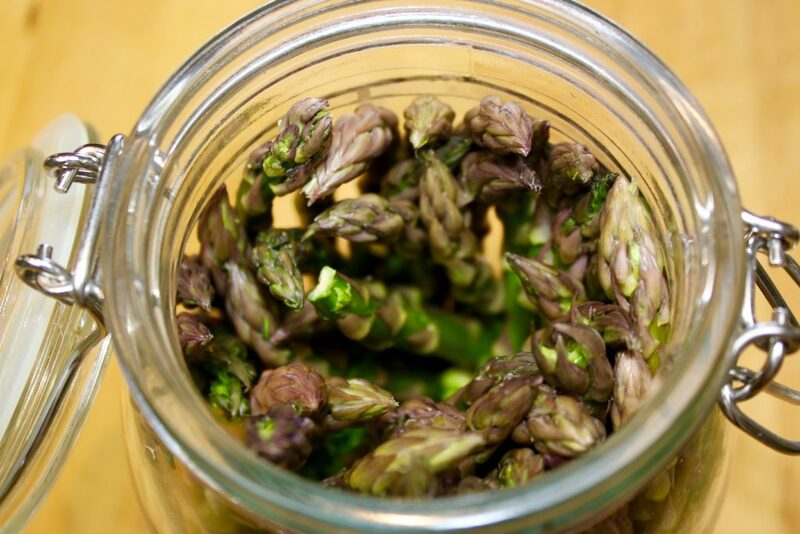 Trim the asparagus so that when placed upright, the tips reach 1″ below the top of the jar. 2. Add garlic, chili flakes and bay leaves to the the jar. 3. 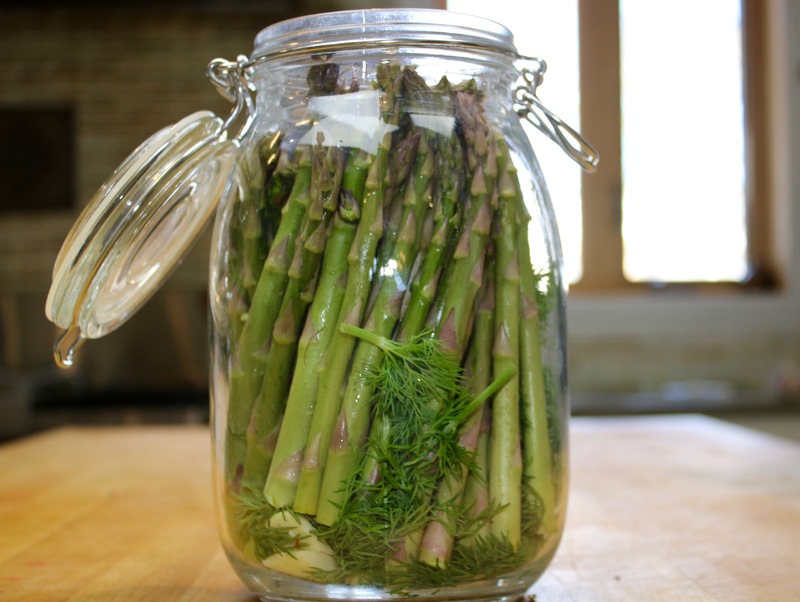 Pack the asparagus upright in the jar, alternating with dill. Cover with enough brine to fully cover the spears. 4. Lid jar and ferment at room temperature out of direct sunlight for 5-8 days. Check that brine level still completely covers the asparagus- top off with more brine if required. 5. After the fermentation period, transfer the jar to the refrigerator. The asparagus pickles will keep, refrigerated, for approximately one year. Probiotic, prebiotic and super tasty asparagus pickles! Cut woody end off asparagus spears. 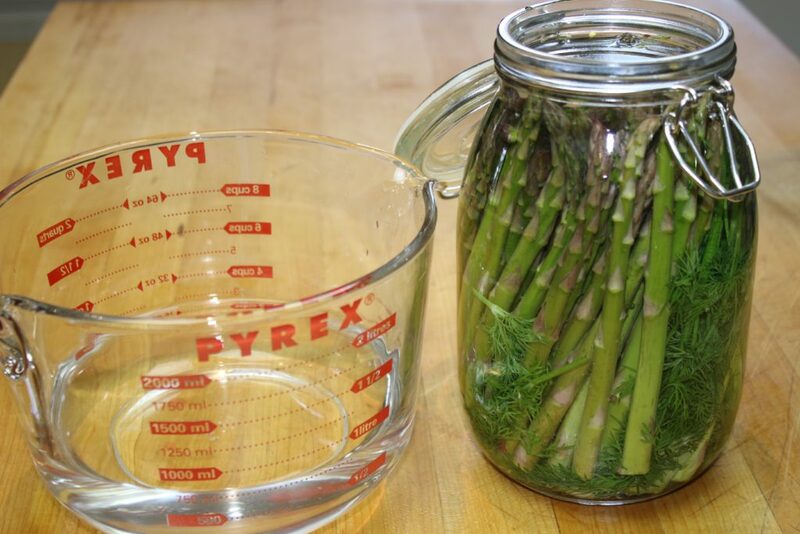 Trim the asparagus so that when placed upright, the tips reach 1" below the top of the jar. 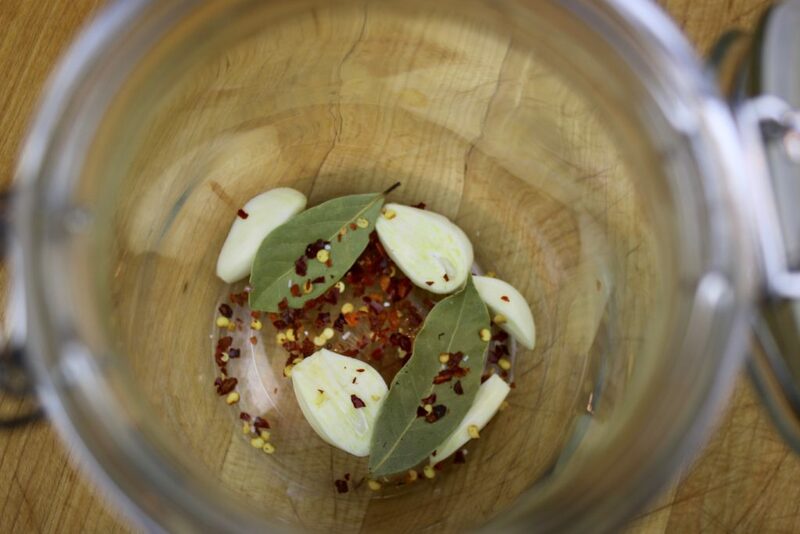 Add garlic, chili flakes and bay leaves to the the jar. Lid jar and ferment at room temperature out of direct sunlight for 5-8 days. Check that brine level still completely covers the asparagus- top off with more brine if required. After the fermentation period, transfer the jar to the refrigerator. The asparagus pickles will keep, refrigerated, for approximately one year. Why am I making 4 quarts of brine for 1 quart of product? Hi Mary- thanks for your interest and question. I always make this amount of brine so that I can have some left over for other projects. It is good to keep a reserve in the fridge for quick, on the go ferments. If you don’t want to make this amount of brine, you can divide the brine recipe. I have one of those Japanese pickling jars that are not airtight but have the lip at the top for any excess brine that may leak out. I use it to make ginger carrots and assume that it will work for asparagus to? Hi Lori- thanks for your question. Nice that you have Japanese pickling jars! Are you sure they’re not airtight? If you are able to make ginger carrots (which are a finicky ferment with the higher sugar content in carrots that Kham’s yeast loves!) then these jars are probably adequate. 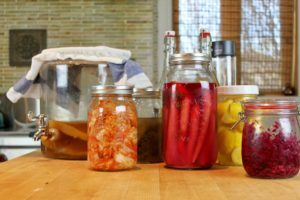 The key is to keep the ferment as anaerobic (oxygen-free) as possible. Do you have to burp the jar during that period? Hi Deb- I use good quality fido jars that are self burping (as seen in the photo on the website). You could use an airlock system, or burp the container every few days, but I find that it’s such a short ferment, that you don’t get excessive CO2 buildup.